You simply must try my deep fried ice cream recipe. Deep fried ice cream is always a novelty. It's a truly extraordinary dessert that never fails to excite whenever it's served, and it tastes extraordinarily delicious. The whole idea of frying ice cream does not seem at all logical, yet the possibility of it fascinates and dares you to try. However, not only is frying ice cream possible thanks to the laws of physics, but it's actually a very easy thing to accomplish. Keep reading, and you'll learn the secret of how to make it. I adapted this recipe for deep frying ice cream from traditional recipes. It's best to make this dessert the day before you wish to serve it, since your preparation must allow enough time for the ice cream balls to freeze rock solid. The success of this unusual frozen dessert depends on them being frozen solid. Using an ice cream scoop and your hands, form 6 to 8 very firm ice cream balls. Use vanilla or any favorite flavor of homemade ice cream, as it will freeze harder than the rather artificial store-bought varieties. Place the ice cream balls in an airtight freezer container so they are not touching, and set them in the freezer overnight to freeze rock hard. Either the night before, or about 4 hours before serving, prepare the batter by mixing until smooth 1-3/4 cups all-purpose flour, 1-1/2 tablespoons sugar (white or brown, depending on your taste preference), 1 teaspoon salt, 1 tablespoon vegetable or olive oil, 1 teaspoon vanilla or almond flavoring, 1/2 cup milk, 1/4 cup water, and 2 egg yolks (reserve the egg whites for use later). Refrigerate the batter for several hours until it is well chilled. Now beat the 2 egg whites until stiff and fold into the chilled batter. The batter should be thick enough to coat the ice cream balls. If it is too thin or too thick, it will not remain on them. Either add more flour or more milk to achieve the desired batter consistency. Carefully coat several frozen ice cream balls with the batter, making sure their entire surface is thickly covered. The coating provides insulation from the heat. Carefully lower the battered balls one by one into the hot oil. Try to prevent them sticking to each other or to the sides of the fryer. Fry them for about 1 minute or so, or until the batter is golden brown in color, then carefully remove them from the fryer and set them on paper towels until the remaining balls are done. Serve immediately on individual plates, but first garnish each ball with whipped cream around the base and sprinkle the top with cinnamon sugar — this is a traditional garnish. Drizzle chocolate or strawberry sauce over it too, if desired. Finally, place a maraschino cherry on top. 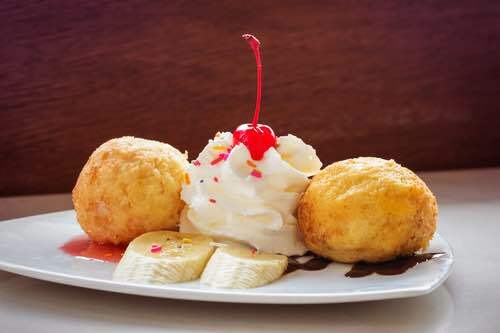 Unlike traditional fried ice cream recipes, this simulated version adds a crispy coating to the ice cream ball to give it a texture and taste similar to fried batter. It is also an easy kid's dessert recipe that anyone could safely have fun making. For the obvious safety reasons, it's not recommended that kids make the traditional-style recipe, which requires deep frying with hot oil. The following method, however, requires no frying or cooking and the results are really quite tasty. This is also a great ice cream dessert recipe for a party that you can prepare ahead of time and store in the freezer for serving later. To make this mock version, use an ice cream scoop to quickly form as many firm ice cream balls as you need. Use your favorite flavor of homemade ice cream. After the balls are formed, you might need to place them in an airtight freezer container and set them in the freezer for a while to harden. You need them to be rock hard! Just before serving, take the frozen balls and roll them in a bowl of crushed cornflakes, pressing them firmly into the cornflakes until they are completely coated with the cereal. Frosted flakes work well too, and they are especially good. Some cooks prefer adding a tablespoon or two of corn syrup or liquid honey to the cereal first, claiming it makes the flakes stick to the ice cream better and helps to simulate the deep fried taste. As with a traditional fried ice cream recipe, add the customary garnish of whipped cream, a sprinkle of cinnamon sugar, and a red maraschino cherry on top. Serve immediately. The history of this unusual frozen dessert recipe is largely unknown, but the decadent treat might have originated in France. Thomas Jefferson returned to America from his stint as ambassador to Paris in 1789 with handwritten recipes for ice cream and his own ice cream making equipment. Soon after his return, Jefferson had an ice house built at Monticello so he could indulge in making ice creams and water ices the year-round. And there is written evidence that he might have also had a fried ice cream recipe. During Jefferson's 1801-09 presidency, one White House dinner guest wrote that he enjoyed an unusual ice cream served "in the form of small balls, enclosed in cases of warm pastry" and that it was "very good, crust wholly dried, crumbled into thin flakes." It's maybe the earliest North American reference to deep fried ice cream. Today, we're still captivated by this tasty, gourmet treat that's hot and crusty on the outside and cold and softly melting on the inside. And why not? It tastes delicious! The deep fried ice cream recipes given above are easy to prepare, and the frozen treat is spectacular to serve and sure to impress. It's so different from the usual frozen fare.